The Iowa State University Chapter of Gamma Alpha Rho (later merged with Tau Omega in 1953 to form Sigma Gamma Tau) was founded in 1949. It is the purpose of this website to provide information regarding the Iowa State University Chapter of Sigma Gamma Tau to the Aerospace Engineering community and the general public, as well as facilitate communications with other chapters. 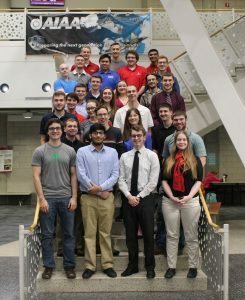 In recent years, Sigma Gamma Tau has been a growing community at Iowa State, continuously grabbing the attention of more and more talented students and upcoming aerospace professionals. One of the goals of the executive board is to continue this growth by establishing more social, professional development, and community service events throughout the upcoming semesters in order to foster a stronger camaraderie and sense of community among its members. Beyond that, it is our goal to expand the community to the department as a whole and to serve the student body in ways that will benefit all members of the aerospace community. Whether it be through departmental projects, acting as leaders in the classroom, developing mentor relationships, or volunteering in the community, it is our goal to always positively impact our environment. Join us in developing and expanding our community and in our promotion of scholarship and professional excellence. Stay updated on our activities, group projects, meeting minutes, and all upcoming events by exploring this website! Don’t forget to join us on Facebook to stay up-to-date with all the latest news and events!